Valentine’s Day is about love and happiness!! We give gifts and make food to show our appreciation and affection but, at some point, this tradition developed into a habit of rushing to the store to pick up mass-produced cards for your child’s classmates and purchasing artificial candies and chocolates. Now we can opt for a low waste, handmade, and heartfelt celebration with a few easy swaps. Make your own cards to hand out. Avoid using non-biodegradable glitter because it cannot be recycled, ends up in the ocean, and is detrimental to our marine life. Print out these adorable valentines! We love the fruit and veggie theme. Use tangerines instead. Use a sharpie to write little messages on them, and give those out instead of paper cards. Take inspiration from conversation hearts: XOXO, HUGS, TOO COOL, YOU ROCK, etc. Start the day off with a cute pink-themed breakfast. 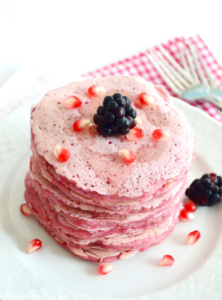 These adorable pancakes get their pink color from a hidden beet! Substitute two eggs if you do not have any flaxseed on hand. 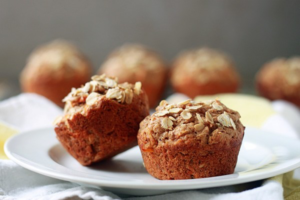 These carrot muffins are another way to sneak some vegetables into your breakfast. Make these the night before for an easy on-the-go breakfast. These would also be perfect to share with your child’s class! These muffins will keep you full and away from store-bought candies. by making your own Valentine’s Day dinner. Cook a dinner that utilizes all the fresh produce from Good Life Organics! 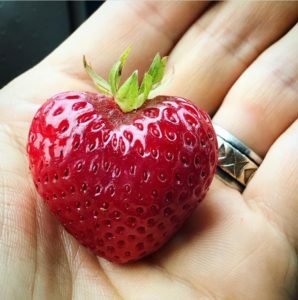 Citrus fruit, broccoli, carrots, and kale are all in season and delicious. We created two menus that celebrate the foods that flourish in the winter. Here is a romantic menu created for two, while this menu is designed to be family-friendly.